A Healthy Lawn Starts Now. Call or e-mail us today to get a quote on making your yard healthy and beautiful for the coming season. 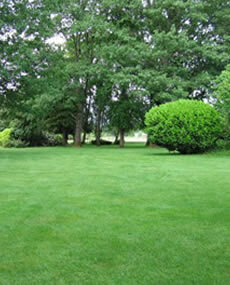 A healthy lawn or garden is the foundation for a visually appealing, enjoyable, and functional outdoor space. Proper clean up in the spring and fall is essential to creating a lush green lawn you can enjoy all summer. A yard clean up completed by ALS will include a customized set of services to meet your individual needs. We offer power raking, deep core aeration, fertilization, edging, rototilling, pruning, and sod services. Call today for a quote! WHAT IS SPRING CLEAN UP AND WHY IS IT NECESSARY? Your lawn's health is dependent on several factors. Soil quality, proper nutrient levels, water flow and drainage, and air flow to the roots all contribute to a beautiful, lush lawn resistant to weeds and disease. Your lawn's spring clean up, including core aeration, power raking, and fertilization, can be essential in maintaining these factors year after year. WHAT IS DEEP CORE AERATION? Plants need air flow to the roots in order to be healthy. Compaction of the soil happens naturally over time in your yard, which is why all lawns can benefit from periodic aeration. The process involves removing small plugs of soil 1 1/2 - 2 inches deep from the entire lawn, depositing them on the lawn's surface. These plugs are typically left on the lawn and break down on their own within a week or so. If you follow core aeration with power raking, the cores will be broken down during this process. Thatch is the layer of dead and decomposing grass plants that accumulates on your yard. It is not a bad thing if you have the right amount of it; this decomposing material returns nutrients to the ground, regulates soil temperature, and reduces water loss. Ideally, your thatch layer should be about 1/4 - 1/2 inch thick. Excessive thatch, on the other hand, can be very bad for your lawn. It reduces the effectiveness of fertilizers, watering, and pest controls, and provides a good habitat for disease and insects. Power raking is the process of removing the excess thatch. We use the power rake to bring thatch to the surface, and then remove it by vacuuming or raking by hand. We do not remove the entire thatch layer, we simply restore it to an appropriate thickness. © Copyright Alternative Landscape Solutions Inc. All rights reserved.